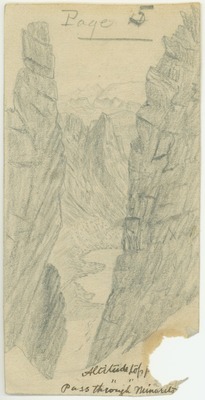 Note on verso: "Pass through the Minarets at head of one of the Owens River Glaciers. Has been used in Century magazine. Better not use it to be exactly like their cut." Engraved version published in "The Passes of the Sierra," Scribner's Monthly, 1879. Original drawing dimensions: 14 x 7 cm.